When his precious blood was poured from his sacrifice on the Cross and he had not sinned, it cried out from the ground as it dripped from his wounds, just like Abel’s blood cried out to Yahweh for being murdered without just cause, and is why it was necessary for him to ask Yahweh to forgive those that did not realize what they were doing. His Christ half became the spirit, and the fleshly body contained the sins of the Adamic offspring, but the blood that cried out for to Yahweh for Justice, it is what became Michael after Christ’s split, because Michael must again become flesh and blood and deliver the Wrath through the spilled blood of the unblemished Lamb. The transgressors that do not receive forgiveness cannot survive being sprinkled with the Blood of the Lamb, and Michael is the Blood of the Lamb, whereas Christ Jesus has moved on beyond flesh and blood. They conquer Dawn by “the blood” that Michael has become, because the “Lamb” is Christ the Word that gives testimony through his slaves for Salvation, and Michael gives condemnation. A Judge – because Christ is the Judge appointed by Yahweh. One side judged to life by Christ, and the other side judged to death by Michael. Since they ae of the same energy – only split in duty – they are unified in both positions they hold on the war’s chess board. As Michael’s blood was poured out to birth Christ anew, those not worthy of that blood sacrifice must be drowned in that blood, because they have violated the sanctity of the merciful sacrifice that was extended to all of the Adamic offspring; therefore, like the Red Sea typified Christ’s spilled blood that was blown up from the earth on both sides in large walls of rolling water, the unworthy will be caught between Michael’s walled forces whose blood reached Mother in Heaven and cries out for Justice, with his holy forces they will be drowned in their sins as surely as the ancient Egyptians were drowned. So what is Michael composed of? He is the cup of Yahweh’s anger because he has tasted that anger first hand, and the Blood of the Lamb that has returned from the Pit to take home those that he is the King over. He is Abaddon, and he is the final chapter for sin on this side of Armageddon. When Michael asked on the Cross why had Mother Yahweh forsaken him, his answer came in Her raising up his memory into a life-force that would Vindicate Her Great Name, because the answer to that question is that the Blood of the Lamb must be poured mngled with Her anger in order to destroy those that came out from under law, and then refused to avoid the Judgment of the Wrath by their own inclinations. The anger and the blood co-mingled, puts them back under law that then causes eternal destruction to each of them because the Sacred Blood and the Anger do not mix. Therefore, a dissolving effect takes place and whatever it touches it is destroyed along with the mixture that brought forth the cleansing of creation. The Vindicator comes forth with the Vengeance of Yahweh. Michael becomes two lambs, in that he is sacrificed twice to rid creation of evil. His second Sacrifice is no less nor greater than his first, because both serve the same cause. Both lambs are of the same Source, so both serve to SAVE , CLEANSE, and to please Yahweh. Two lambs. One SAVES – One executes Judgment in Yahweh’s name. He’s our courageous leader against the evil of creation. He’s differentiated from being Christ because he is split or “Y” off as the Blood of the Lamb returned to finish his work that he started when he dripped from Christ whom was on the Cross. What Satan had done caused innocent blood to cry out to Mother. Michael cannot rest until his Holy Mother can again be called by Her female name, Israel. Then She will be praised on Her throne by the people of Her Great Name. 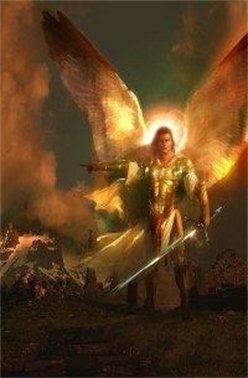 This entry was posted in Angels / Holy Angels, Archangel Michael, Spiritual War, Vindication, Yahweh and tagged Archangel Michael, Michael the Archangel, Vindication, Yahweh. Bookmark the permalink.